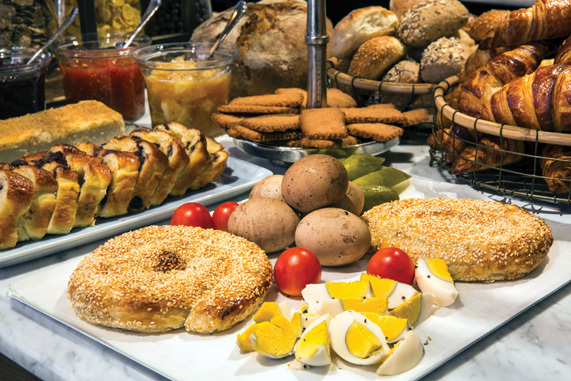 Breakfast buffets are as synonymous to Israel as bread is to butter, with Middle Eastern salads, cheeses and spreads consumed in their abundance. Having feasted on more than a few Israeli breakfasts, I was intrigued as to why those offered at 65 Hotel and Market House Hotel, two Atlas Hotels properties, have grown to their status of acclaim. I had to get in line and taste for myself. The beetroot carpaccio is particularly exceptional. The thin beetroot slices cut with ease, a pleasing sweet and savory blend with a presentation fit to grace the tables of any quality restaurant. The tabbouleh, infused with sliced almonds, is equally as delightful, a satisfying combination of textures. An à la carte menu lists the made-to-order options – eggs – scrambled, fried, or baked in a traditional shakshuka, and brioche French toast with fruity condiments. Those like me, whose sweet tooth may get the better of them, will be enticed by the lineup of flavored halvas (Middle-Eastern sweet), pastries, fruity jams and fruit salad for the taking; not to mention the plates of mini cakes, a marble loaf and, to quench your thirst, a rainbow of freshly bottled juices. “It’s this attention to detail and scope of our offerings that maintain our popularity among tourists and locals,” says Kronkop. As my last bite is demolished and my plate is licked clean, I fantasize about my return to the buffet tables, where so many tastes remain unsampled. My advice to you, whether you decide to eat breakfast at 65 Hotel or Market House – come hungry. Breakfast is served daily, Friday and Saturday until 2pm.